Sarah Susan Elizabeth "Lizzie" Larkey was born 11 Jun 1884 in Sullivan Co., TN and died 03 Aug 1978 in Sullivan Co., TN. She was the daughter of Allen Harrison Larkey and Sarah Elizabeth Hicks. She married (1) Noah Thomas Myers 16 Oct 1901 in Sullivan Co., TN. He was born 09 Dec 1876 in Sullivan Co., TN and died 28 Feb 1914. 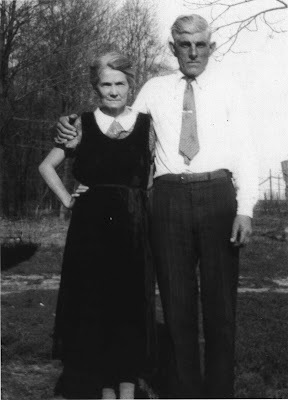 She married (2) Bruce Anderson Gooden 06 Oct 1916. He born 23 Jun 1885 in Sullivan Co., TN. Lizzie is buried in Arcadia Cemetery, Sullivan Co., TN. Lizzie was the brother of John Hickam Larkey. Lizzie's granddaughter sent me this photo of Lizzie and her husband Bruce.